Vredefort is a small farming town in the Free State province of South Africa with cattle, peanuts, sorghum, sunflowers and maize being farmed. It is home to 3,000 residents. The town was established in 1876 on a farm called Visgat, on the Vredefort crater, the largest and oldest visible bolide impact crater in the world (with a diameter of 300 kilometres (190 mi)). It was this approximately 10-kilometre (6.2 mi) wide bolide that led to the preservation of the gold-bearing reefs of the Free State some 2.02 billion years ago. 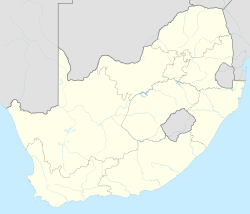 The town got its name after the peaceful conclusion of a threatened war between the Transvaal and the Orange Free State. The British built a concentration camp here during the Second Boer War to house Boer women and children. The Vredefort Dome (Crater) is currently the largest and one of the oldest known meteor impact site in the world. It is South Africa's seventh World Heritage Site and its status is largely due to the efforts of research scientists from Wits University. ^ a b c d Sum of the Main Places Vredefort and Mokwallo from Census 2011. Wikimedia Commons has media related to Vredefort. This page was last edited on 25 March 2019, at 19:57 (UTC).